Felder certainly has reason to celebrate. His 2012 solo album Road to Forever (which has been recently re-released with four additional songs) has garnered no shortage of critical and popular acclaim, producing four hit singles to date, including the venomous rocker “You Don’t Have Me,” which is now enjoying its second week atop the Classic Rock radio chart. The four additional songs on the new “extended edition” of Road to Forever are ones that you’d written originally for the album, right? Didn't you write something like 26 songs in all originally? Yes, I wrote 26 or 27 songs. I pared it down to what I thought would be the best 16 songs to put on an album, and went and recorded 16 songs. When they were finished we were getting ready to do final artwork, packaging, and also final manufacturing for the CD itself, and we got a call from the record distributor and my management and they said, “Amazon wants an exclusive song off the record; and iTunes wants an exclusive song; and we have a deal with Japan, they want an exclusive song; and Europe and Australia want an exclusive song.” So I had to pull four songs off of the CD and release it originally with 12 songs on it, which my full intent was to have the full 16 songs on the CD; I thought that made a really well-balanced and interesting collection of songs and a diverse collection of songs and music as well. So I was somewhat upset that I had to pull, like, a fourth of the songs of it and then wind up putting it out with less.… It’d be like if you had the Hotel California album and you left off “New Kid in Town” and “Fast Lane,” it’d be like, “Wait a minute. Those are all a part of the concept for that record.” So I suggested that we repackage it with all 16 songs in a deluxe edition and put it out for everyone to hear. Is that why the four songs are weaved throughout the album instead of being tacked on at the end, because this is how you’d intended it all along? Correct, yeah. Song order on a CD is really important, and that was the song order I had laid out for the CD originally. Then we had to go through and pull out those four songs and it still worked, but I just wanted to release it the way I’d initially heard it, conceived it, ordered it. A couple years on now since the original release of the album, do all the songs wear well with you? Yeah, they do actually. A lot of art to me comes from life experiences, whether it’s painting or film or books or music or songs… It all comes from things that people can relate to so that when people see or hear or walk by and photograph it reminds them of something that happened in their own life as well. They’re wearing quite well. In fact one of the songs, “You Don’t Have Me,” is currently Number One on classic rock radio. It’s doing pretty well. I was more than pleasantly surprised with radio’s reception of all the singles we’ve put out. The one before that was “Wash Away,” which got up to Number Four on classic rock radio. I think they’re wearing well with me and it seems that they’re wearing well on classic radio as well. 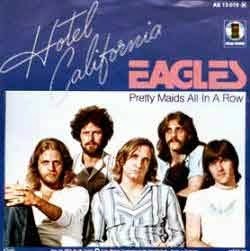 Back in the day with the Eagles, were you guys ever mindful or curious about chart positions of singles? Was that sort of thing even on your radar? Well, I’m certain our management and record companies were paying a great deal of attention to what songs were getting action and radio airplay and were being sold as singles. I’m certain they were paying really close attention to that and promoting the songs that obviously were getting the most radio airplay. It’s an interesting concept and it’s changed substantially: Back in the ‘70s and ‘80s people bought entire albums, so the A&R department and the artist and management would decide what one, two, or three singles on that album would be released and in what order. Then the promotions teams would go out and promote for radio. PR people would go out and promote news about that single and so forth. Radio has changed and album sales have changed so dramatically where if you like a particular song you just go on iTunes or Amazon and just buy that one song. The whole kind of model for CD monitoring and sales is done all digitally now as opposed to counting how many units were manufactured, where they were shipped to, and what market was it playing well in on the radio [so] they would supply more product to that city or those record stores. All of that has changed dramatically. It’s a lot more accessible to be able to buy a CD if you like songs on it or you can buy one individual song as well. I think it’s a good change. So you guys never arrived to play in Milwaukee, for instance, and realized not enough people knew the latest single to know what you were doing at the time? It really depended dramatically on every individual market back in the ‘70s. Now radio’s pretty much one or two massive conglomerates—they own all the radio stations. Back then, it was more individual by city and/or state. And if a certain programmer at a certain station loved your record they would play it as much as they wanted to, as much as they got phone response for it. Now it’s all kind of digitized and done on a national level so you don’t really have that much discrepancy from city to city or state to state as you used to have back in the ‘70s. We would get to certain markets and be surprised that people hadn’t heard the song as much as they’d heard it in a bordering state back then, but today everybody pretty much has access to it either online or on the radio, some source where they can find what they want to listen to. This “Soundtrack of Summer” tour you’re on with Styx and Foreigner, it seems like something that really couldn’t have been done in the ‘70s. People seemed to have had enough trouble getting along with their own bands, never mind that plus two other bands. Well, yes and no. In the ‘70s the Eagles and Fleetwood Mac toured together for at least a summer, if not more. I was talking earlier about some bands having a bigger radio airplay in certain cities or certain areas… We would flip headlines, so if “Hotel California” was a bigger song in a certain city the Eagles would close, and if one of Fleetwood Mac’s songs was a bigger airplay hit in that city, they would headline and close the show. But we never had any real ego problems between the bands. As a matter of fact Don Henley was dating Stevie Nicks at the time, and after they broke up Joe Walsh started dating Stevie Nicks. It was less than combative between the bands. We got along really well. I still play golf with Mick Fleetwood now and then. There’s no hard feelings about any of that. I have to say, though, when the proposition of doing this summer tour with Styx and Foreigner was first presented to me, I had to take a minute and really think about what it would be. Styx and I have done shows together, and the people that are involved in the Styx band and crew and management are really nice people. There’s no ego. There’s no drama. There’s no intensity. It’s a lot of fun. They love what they’re doing and they do it really well and we get along really well together. I had the pleasure of interviewing James “JY” Young a little while back, and he was the most genuinely kind man. He seemed so authentic in his enthusiasm for what he does. Yeah, and you can sense that in people, not only in their music but in their stage presence and how they are and how they handle themselves and conduct themselves on and off stage. The people that are in these two other organizations, Foreigner and Styx—not only in the bands but in their crews and management—are just delightful people. It’s a pleasure for me to go on stage every day to not only play music with my band and to sit in with these guys but to live with them 20 hours a day off the road where you’re having brunch together or you’re hanging out backstage before the show. They’re just real good guys. It’s going to be a really great summer for me. One thing I’d like to get your take on is the Rock and Roll Hall of Fame. This year’s induction sparked so much debate—of course they all spark debate, but this time in particular it extended to some of the inductees themselves, who criticized the voting process and minimized the honor. The Eagles’ induction [in 1998], is it something you’re particularly proud or appreciative of? What do you make of it? Whatever field you’re working in there’s only a few honors that can be bestowed on you that really represent an acknowledgment of your creativity, your success, and acceptance of your work. And in the music business there’s just a few, just a handful of accolades—like winning a GRAMMY® for song or record of the year. Being inducted into the Rock and Roll Hall of Fame really is one of the highest honors in the music business that a rock and roll musician can really hope for and should be very gracious upon acceptance when the induction takes place with that. It’s difficult for me to watch people squabbling and arguing about it. Although, I have proposed numerous times to the people at the Rock and Roll Hall of Fame—because I do shows with them and work with them, do benefits to raise money for the Rock Hall—to categorize the inductees, much like the GRAMMY® does: They have Best Country Artist, Best Pop Artist, Best Rock Band, Best Vocal by Duo or Group. It’s more categorized so that you don’t have people in the same eligibility.… Like KISS and Donna Summer, how do you compare those two acts to be worthy of being inducted into the Rock Hall? Now if they were in their own categories then it would be easy to separate: Donna Summer should’ve been inducted as a pop/disco singer, as opposed to KISS, which is a totally different band. How do you vote for or justify that? Donovan, how do you compare him to Aerosmith? It needs to be categorized. You know, it’s run the way it is and I respect their decisions and I’m honored to be a part of the Rock Hall. My original double-neck white Gibson EDS-1275 that I played on for years on “Hotel California” is on exhibit at the Rock Hall in the Eagles showcase there. It’s quite an honor being part of that. A lot of the squabbling this year was with KISS, with some of them criticizing the fact that no members beyond the original four were inducted. The Eagles were fortunate in that there were only seven people that were involved in the band, and we asked Bernie [Leadon] and Randy [Meisner], who had since left, to come and participate in the induction and receive the award because they had been a big part of the original founding concept and early records. We felt that they should be part of it. But if you’ve got a band that has a lot of transient members, it’s difficult to do that when you’ve got 17 guys on stage being inducted into one group. Dates and venues for the Soundtrack of Summer tour, featuring Don Felder, Styx, and Foreigner, are listed on donfelder.com. 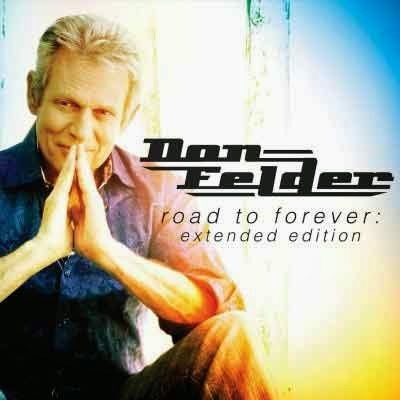 Road to Forever (Extended Edition) is available now on Top Ten, Inc. Records.